Osaki has launched a sister chair to the OS-3D Pro Dreamer, called the OS-3D Pro Cyber. Another chair in the Osaki family loaded with features, and in some ways better than the Dreamer, but at a very reasonable price point. Massage-chair-relief.com, the leading retailer of the latest massage chair industry innovations, announced this week that they are now carrying the latest offering from Osaki, the OS-3D Pro Cyber. 2013 has been a fantastic year for Osaki, seeing them release far more groundbreaking chairs than any other company in the industry, and cementing their place as a leader in massage chair technology. The latest chair from Osaki, the OS 3D-Pro Cyber, comes with a plethora of features that are as forward thinking and sleek as the name of the chair implies. The beating heart of the OS 3D-Pro Cyber resides in the 3D roller technology. The chair comes with 5 3D roller intensity-levels that can be adjusted to provide a full massage experience; one that not only massages up and down and side to side, but also back and forth, giving a 3-dimensional massage experience. If a massage chair shopper is looking for the most vigorous mechanical massage available on the market, the OS 3D-Pro Cyber is the ultimate choice, offering rollers that protrude to a maximum of 3.15”. Durability and longevity have also been addressed in the engineering of the OS 3D-Pro Cyber. The airbag technology of this chair has been designed in such a way that the chair requires less airbag cells, yet covering a greater surface area of each body part. This equates to less valves being used and less stress on the hardware of the chair. Couple this together with 1-year parts and labor, a 2-year parts, and a 3-year frame warranty, and the OS 3D-Pro Cyber begins to appear as a solid investment. 2013 has seen zero gravity become an industry standard in the majority of high-end massage chairs. The OS 3D-Pro Cyber has taken this technology one step further and offers a two-stage zero gravity feature. The first rests the user at the traditional 30-degree angle while the second offers an even deeper tilt for the ultimate in weight distribution, minimal resistance, and maximum massage benefit. Mechanical foot rollers are also something of a buzz in the massage chair industry this year, and the OS 3D-Pro Cyber capitalizes on this interest by adding two mechanical foot rollers per foot. Foot rollers are the ultimate in relaxation, and beyond pure relaxation, massage of the feet offers additional reflexology benefits that have been acknowledged for over 2,000 years. But before the 3d roller technology, the mechanical foot rollers, and the zero gravity feature all work their therapeutic magic, a computerized full body scan takes place. The scan begins every time a user sits in the chair, mapping out the intricacies of the spine to deliver the most effective and personalized massage possible. Thanks to the groundbreaking technology of the OS 3D-Pro Cyber, the computer scan offers a massage with greater accuracy than has been seen before. There are numerable other features of the OS 3D-Pro Cyber that warrant an in-depth description. These include heat therapy dedicated to the lumbar region, airbag twist motion that twists the lower and upper body, chromotherapy, an auto-extend ottoman, a 30-minute auto timer, and not to mention a cutting edge MP3 stereo system. All in all, the OS 3D-Pro Cyber is one of the most comprehensively feature-rich chairs on the market, and at a very palatable price point. 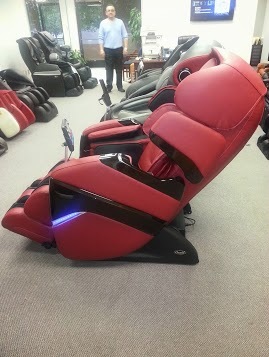 To find out more about the OS-3D Pro Cyber or to experience one, contact Dr. Alan Weidner, founder and CEO of massage-chair-relief.com by calling 888-259-5380 or visit http://www.massage-chair-relief.com/massage-chairs/osaki/osaki-os-3d-pro-cyber/.